The Handbook of Shock Waves contains a comprehensive, structured coverage of research topics related to shock wave phenomena including shock waves in gases, liquids, solids, and space. Shock waves represent an extremely important physical phenomena which appears to be of special practical importance in three major fields: compressible flow (aerodynamics), materials science, and astrophysics. Shock waves comprise a phenomenon that occurs when pressure builds to force a reaction, i.e. sonic boom that occurs when a jet breaks the speed of sound. This Handbook contains experimental, theoretical, and numerical results which never before appeared under one cover; the first handbook of its kind. 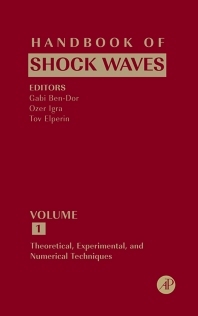 The Handbook of Shock Waves is intended for researchers and engineers active in shock wave related fields. Additionally, R&D establishments, applied science & research laboratories and scientific and engineering libraries both in universities and government institutions. As well as, undergraduate and graduate students in fluid mechanics, gas dynamics, and physics. Researchers and engineers active in shock wave realted fields; R&D establishments, applied science & research laboratories and scientific and engineering libraries both in universities and government institutions; undergraduate and graduate students in fluid mechanics, gas dynamics and physics.